​I have already registered but need to withdraw from the program. Can I get a refund? Registration fees are not refundable. Students are suggested to review all details to ensure they can commit to the program before registering. If there are questions or concerns, feel free to call or email us. Rental fees for guzheng, yangqin, pipa, liuqin, zhongruan and erhu is refundable only if CYCS cannot fulfill the rental requests. If students decide to use their own instrument or change to another instrument later, rental fees will not be refunded. ​How is the summer program different from the regular program? ​The summer program is offered mainly for beginners who may or may not have any musical experience. It offers an opportunity for students to experience playing an instrument in a positive and family-oriented environment. Students can explore their interest in music and in various instruments. The summer program allows students and parents to experiment the classes before they commit to the year long regular program. The summer program usually has a larger class size and may have student volunteers assisting instructors in class. The regular program has a smaller class size and is taught only by instructor. My child is 6 year old but minimum age is 7. Can I still sign up for the class? ​All classes are conducted in groups. For most classes, minimum age is set such that young students will be able to follow teacher's instruction in a group setting. Students who are younger might still be able to sign up if they are mature enough to sit through a one-hour class. For children of age 5-6, please consider Chinese percussion class. ​There are two sessions for my instrument class. Which one will I go to? 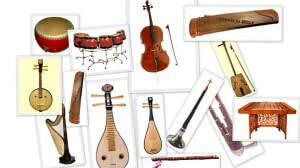 ​For some instruments, two sessions are offered at different times. Before program begins, students will be assigned to one of the sessions based on age and music experience so that students will similar level will be learning together. If students need to switch sessions, students must coordinate with their respective teachers during the first day of class. ​Can I choose or change my instrument after the summer program begins? It is recommended that you made a selection during registration so that we can ensure an instrument is available for rental or purchase before class begins. Changing to another instrument is allowed as long as the class is still open. However, when you change to another instrument, there will most likely be delay in getting your instruments if renting or purchasing through us. View videos on youtube channel to see performances of various instruments and see which one interests you most. Come and enjoy our annual concert. During the concert, we will introduce most of the instruments and a short demo will also be presented. ​Is an instrument required to attend the classes? ​For all instrument classes except for Chinese Percussion, each student must have an instrument to participate in the class. For Chinese Percussion, students will be provided with drums during class. ​Is there any tuition costs for the summer program? ​The beginning level summer program is offered free of tuition fees. There is however a $40 registration fees which is due upon registration.